With this program you can change the cpu-speed, the ram- and the lcd-timing to get away those nasty ghost-lines and the flickering ... and to gain some speed :). This daemon allows you to change the CPU speed while playing games / emulators. For now the --help output and the Item Help are the only documentation about the daemon. on FW 1.4 you can't alter the cpu-speed with the menu. You have to write scripts for every application you want to overclock. 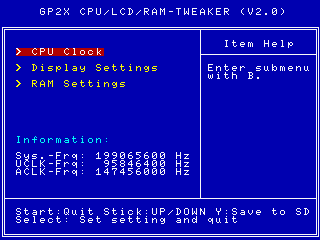 That's because the menu from fw 1.4 clocks the GP2x down for filebrowsing and back up to 200mhz when you start a program ... so it overwrites the tweaker-values. Good tool, even on 1.4 it got it's use. Do the values save and work on 2.0? sorry ,he battery has no electricity. Sorry, but I cant see the executable file in my Games-Folder... How can I start this programm? Thanks for including the source! I can't get it to work. Whatever I tried the clock speed doesn't change.